Kids having fun with HANDOG coordinator, Mr. Allain Paragas. How does one make summer a wee bit “cool”? No need for a perfect rendezvous or a nature get-away. On a balmy summer, the Western Mindanao State University (WMSU) Hands of Goodwill (HANDOG) knocks at your door, provides recreational classes and exudes a kindred spirit. This year, HANDOG reached out to the residents of Kalinaw community, Phase II in Sinunuc to offer the Summer-is-cool program held last May 1 to 8. 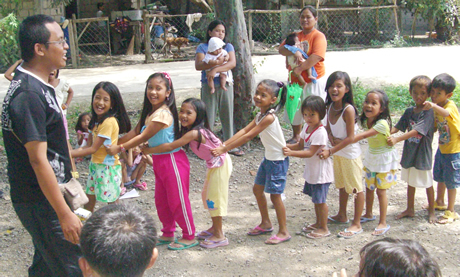 The Summer-is-cool program is one of HANDOG’s extension activities that seek to provide literacy, arts, livelihood and recreational classes among residents of urban-poor communities. On its 7th year now, the program was directed to none other than the residents of Kalinaw community as requested by the community’s President, Juanita Cabagutan. Diverse courses were offered namely arts appreciation, music and theater appreciation; cellphone repair, t-shirt printing, hair science and sports clinic to include basketball, chess, volleyball and karatedo. Music Appreciation class. The class huddles up to sing in harmony. The classes were not only intended for the kids and youths but also for the elders who were interested in livelihood classes. While the mothers and ladies took time to discover how to fix hairdos in hair science class, the fathers and the young gentlemen converged to learn cellphone repair. The others went to practice hands-on t-shirt printing which can be a potential source of income for interested households. 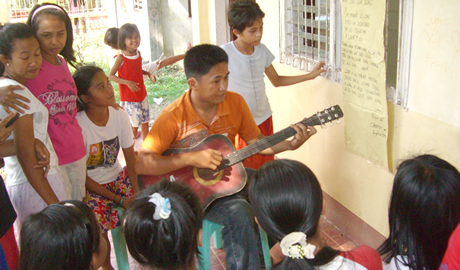 The kids and the youths went to classes to enhance their arts and musical skills and prowess through the arts appreciation, and music and theater appreciation. They drew, painted, swayed to the rhythm of music and sung at the top of their lungs. In sports, the kids and the youths gathered in a show of sportsmanship and camaraderie. While a bunch of youths slammed the ball in the much-coveted basketball competition, the others dived to catch the projectile-falling ball in volleyball. The chess guru, moreover, worked their minds out to make the right moves. T-shirt printing class. A way to generate income! During the culminating activity, Dr. Milabel E. Ho, Vice President for Research, Extension and Development where HANDOG falls under, attended the showcase of talents which was ensued by the basketball and volleyball competitions. Dr. Ho was delighted to see how HANDOG finds its true meaning of reaching out to the communities as encapsulated in the university’s vision and mission – that is to be of service to the community. She lauded the effort of the entire HANDOG team composed of 10 faculty volunteers and 13 student volunteers headed by its coordinator, Mr. Allain Paragas. “What’s good about the summer-is-cool program is that we do not only conduct classes by sharing what we know and honing what they innately possess,” said Paragas. “It’s more than that. We get to know the people, share stories with them, dine out together during lunch and yes – bond with each other. At the end of the day, we’re like one big extended family,” he added. Isn’t that a great example of a “cool” summer? HANDOG does a lot more. Aside from making summer cool, HANDOG extends its valuable time and heartfelt effort, shares knowledge and skills, and touches the hearts and spirits in need. Yan ang handog ng HANDOG!